When George Clooney was named People's Sexiest Man Alive in November for the second time, he joked that his pal Brad Pitt, also a two-time winner, would be upset he'd lost his advantage. Now, The ShowBuzz has learned that the tongue-in-cheek battle for bragging rights between the two Hollywood hunks may come down to the size of their feet. The "Ocean's 13" actors joined their co-star Matt Damon and the film's producer Jerry Weintraub at Grauman's Chinese Theater in Hollywood Tuesday, where they got down and dirty by adding their hand and footprints to the cement in front of the theater. "If I had to be on my hands and knees with three other guys I can't think of better guys to do it with," Clooney quipped as he spoke to the crowd. Clooney, Damon, Pitt and Weintraub are now immortalized alongside 236 other members of Hollywood royalty — like John Wayne and Marilyn Monroe in a tradition that goes back 60 years. "It's an honor," Clooney told Brandon Jacobsen of CBS Mobile News. "The first thing you do when you come to Hollywood is you come out and stick your hands and feet in somebody else's footsteps." Clooney doesn't think he'll come back to check out his own footprints, but he said he might come back to check out those of his Sexiest Man Alive rival. 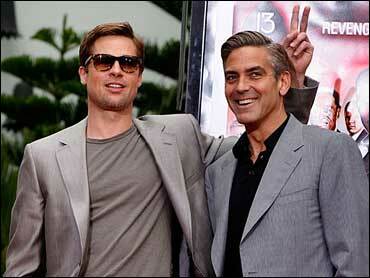 So who's got the bigger feet, Pitt or Clooney? "He's got very small feet," said Clooney, in mock seriousness. "I don't want that out, 'cause you know how those rumors can start."